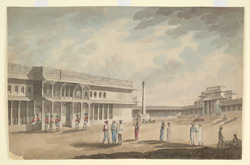 Water-colour painting of Tipu Sultan's palace at Bangalore by James Hunter (d. 1792) in 1792. Inscribed on the front is: 'Square at Bangalore' and on the reverse: 'The Entrance of Tippoo's Palace, Bangalore Feby. 92' This is probably the original water-colour from which an aquatint by J.C. Stadler was made for 'Picturesque Scenery in the Kingdom of Mysore', published by Edward Orme, London, 1805, plate 12. The palace was built as a summer retreat by the Raja of Mysore, Tipu Sultan (1753 -1799). It took ten years to build (1781-91) and was named ‘Rash-e-Jannat’ or the ‘abode of happiness and the envy of heaven’. It consists of two storeys resting on a low stone platform with audience chambers to the front and back and gardens on either side. The palace contains 160 pillars some of which reach to the ceiling of the upper storey. Originally the palace was decorated with frescoes incorporating delicate white flowers on a brick-red background with borders in the form of a frieze of gold flowers and leaves on a white base.